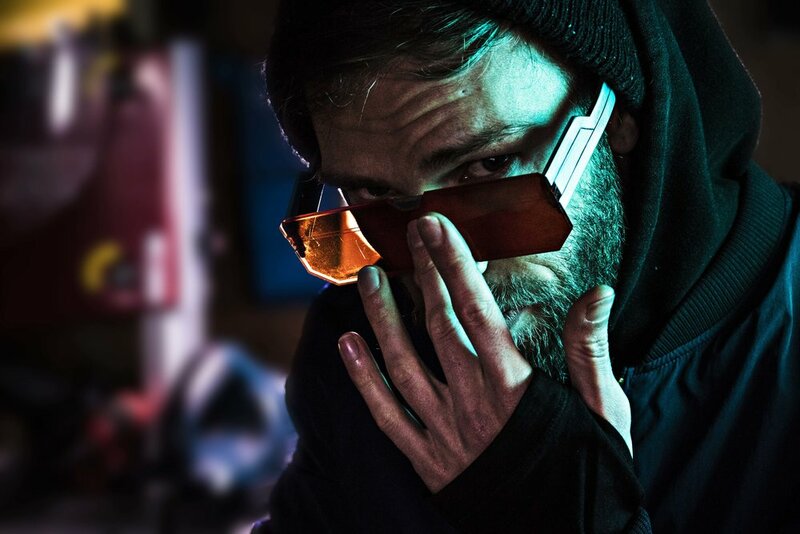 After watching the gameplay trailer for the upcoming video game Cyberpunk 2077, by CD Project Red, I thought it might be a bit of fun to try and replicate the glasses worn by a character called Dexter Deshawn. This is a pretty straight forward build using a little bit of 3D modeling and laser cutting. I have all my project files and a vector pdf template for you to use here, if you would like to make your own. Laser Cutter (plenty of places locally or online will be able to help you if you do not have access to one). Sandpaper, just a little bit. The vector template has everything you need, so get that cut out first. With the pieces all cut, we can start gluing them together. Start with the lens hinges. I’m using acrylic solvent to glue these together - which you really don’t want to get on your fingers - super glue would work fine here too. I used a little drill bit to help me line the pieces up while I added a couple of drops of glue. Repeat the gluing process with the arms and their hinge inserts. Just lay them flat against the table and add a couple of drops of glue. To add a slight curve to the arms of the glasses you can gently heat them up with a heat gun until they start to droop slightly. Then match the curve for the other piece by laying it on the first one as it cools. Once the paint’s dried you can glue that bridge piece in. The last step is to screw the hinges together - I pulled some screws from a pair of old safety glasses I had, but gluing in a piece paperclip wire also works pretty good.